Hackensack, NJ, August 2018: Continuing the ever-growing trend of LiveU use for professional sports of all types and levels, London-based football club Charlton Athletic FC has deployed LiveU to enhance the experience for its fans, streaming a variety of live content on its website and to screens in its football stadium, The Valley. The technology was supplied by LiveU’s UK partner Garland Partners. The League One club, formed in 1905, has a proud history in the English leagues. In mid-2017 it launched a new website and as part of that, it brought video production in-house. Wanting to drive traffic to the site, and increase fan engagement, the club’s aim was to be able to stream live, high-quality match coverage – as well as other events – from remote sites to its followers using multiple cameras. Charlton turned to LiveU, knowing that other clubs had successfully used the technology; also knowing that it would allow them to achieve their aim of remote, multi-camera productions with the vision mixing and additional production carried out at The Valley. 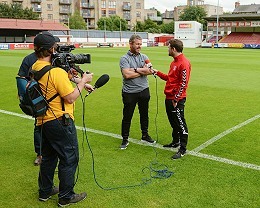 The first team pre-season tour of Ireland was covered using two crews: two camera operators and a supervisor in Ireland with a Director, Vision Mixer and Replay Operator back in the stadium in London. The LiveU portable transmission units feed a LiveU server, which in turns feeds a NewTek Tricaster and, via a router, a replay machine.